FARGO, N.D. – The Central Illinois Flying Aces fall to the Fargo Force, 4 to 2. Thirty-five seconds in, Central Illinois got on the board first. Trevor Janicke (Maple Grove, Minn.) kept the puck in at the blue line and passed to Philippe Lapointe (Burr Ridge, Ill.) in the high-slot. Lapointe found Sebastian Dirven (Cornwall, Ont.) at the point. Dirven fired the puck, and Tyler Gratton (Pottstown, Penn.) tipped the puck from right in front of the crease. Fargo came back with a vengeance several minutes later, scoring two goals in a forty-one second period. Ben Meyers scored on the rebound for the Force after a stuff attempt did not work. Zach Faremouth got the lead for Fargo when he received a pass on the backdoor. Central Illinois had to be strong on the penalty kill in the first as they successfully killed off a five-minute major. Connor Mayer (Champlin, Minn.) tied the game for Central Illinois late in the first. This meant that both Mayer and Gratton marked their first game back in Fargo after being traded to Central Illinois with goals. Janicke won a battle behind the net, and Lapointe picked up the loose puck. 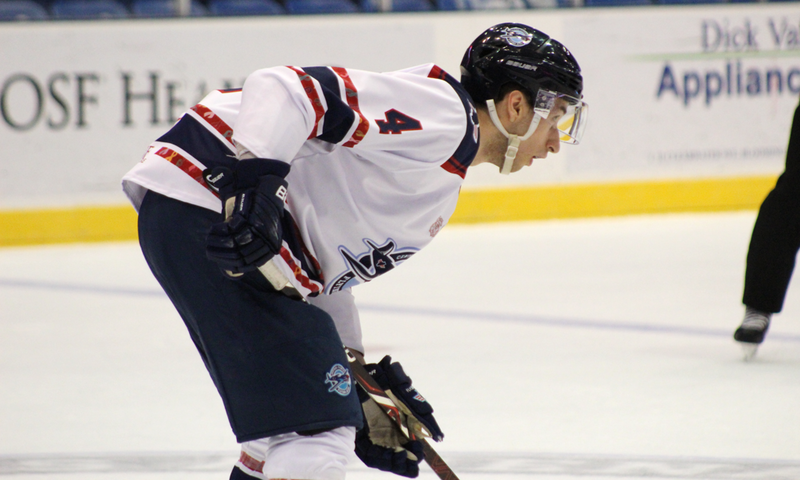 The University of Michigan commit quickly fed Mayer in the low-slot for the Aces’ second of the night. Fargo finished the period with another goal after they broke out on a four-on-two and Justin Lee scored from the slot. After a five-goal first period, neither team could score on a goaltender during the rest of the game despite multiple power play opportunities for each team. Central Illinois controlled play in the third, outshooting Fargo ten to six, but could not crack the goaltender. The Force iced the game with an empty netter for a final score of 4 to 2. Tomorrow night, the Aces remain in Fargo for their second night of the series against the Force. Central Illinois returns home next Saturday (March 30th) against the Muskegon Lumberjacks in their second to last game of the season. They travel to Dubuque on Sunday, March 31st for an afternoon game against the Buccaneers.